This is a very well done reading of an important book. In the first place, it gives you everything you want from a philosophical audiobook -- it presents a crisp, elegant reading of the material. But I think more importantly and more interestingly it relies on an interpretation of the tone of the book which I have not encountered anywhere else. The narrator eschews the standard bombastic reading of the prose for a far more nuanced, subtle and theatrical reading. 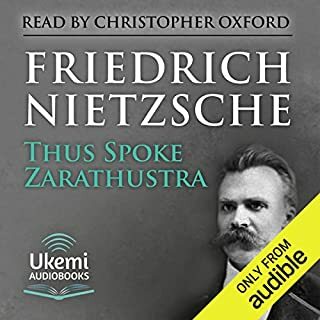 I can see how some people might not like that, since it's a fairly unorthodox approach to the tone of the book, but this certainly challenged my previous feelings about the rhythm of the prose (thus also Nietzsche's intent) which is really, I think, a special accomplishment for a philosophical audiobook.